"Black Mountain_June Colors" 24" x 48"
This is the first session, blocking out the colors and shapes for this large painting that will hang at the end of the bar in the Two Bird Cafe. This is Black Mt. from Pt. Reyes-Petaluma Road, headed towards Pt. Reyes Station, just before Bob Gallagher's property(I believe?). 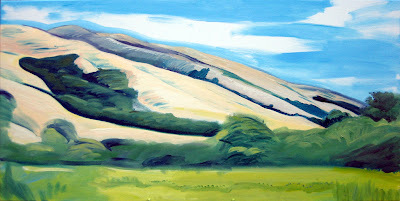 In the summer, the colors in the warm grasses on the hills provide a strong contrast to the dark, green trees. 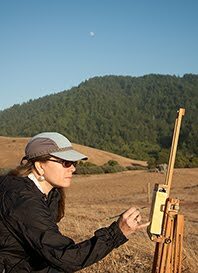 I wanted to do at least one painting in my show which portrayed this effect in the West Marin landscape.